If you’re an Apple fan and have both the iPhone and Apple Watch, then the Just Mobile HoverDock charging stand’s might be for you. The stand features a magnetic charging cable, a design to keep your devices upright, and a full maximum charge-up for both your iPhone and Apple Watch. The HoverDock charging stand also comes with a very hollow yet soft plastic structure with an unibody aluminum disc, to help store all of its charging cords it comes with. This charger is also great for setting on top of any table, desk and nightstand for a clean, chic type of look, while storing and charging both your devices. Now something worth noting is that the dock for the iPhone and Apple Watch are sold separately for both $34.95 at Amazon.com, but still have an equivalent design and specs, just so you know. One of course is compatible for any Apple smartphone and the other is compatible for just about any Apple Watch. 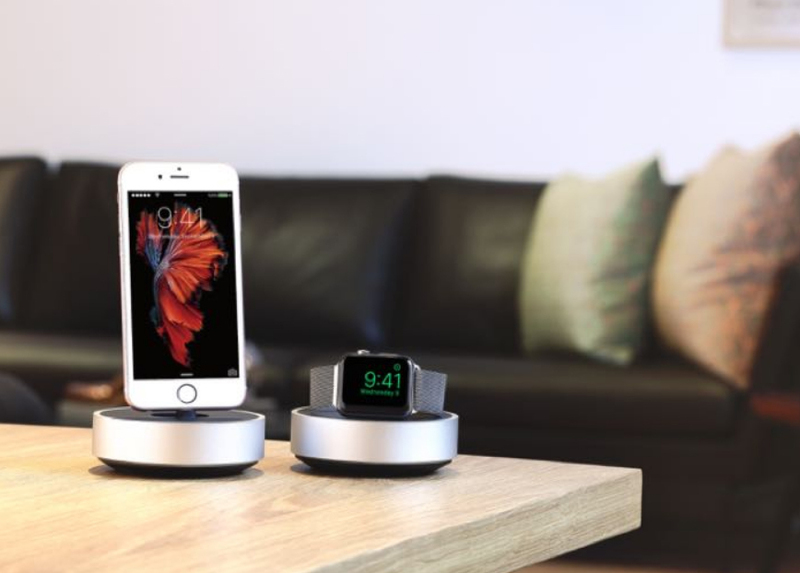 For more information about the Just Mobile HoverDock charging stand for both the iPhone and Apple Watch, you can simply click on the links for more details.